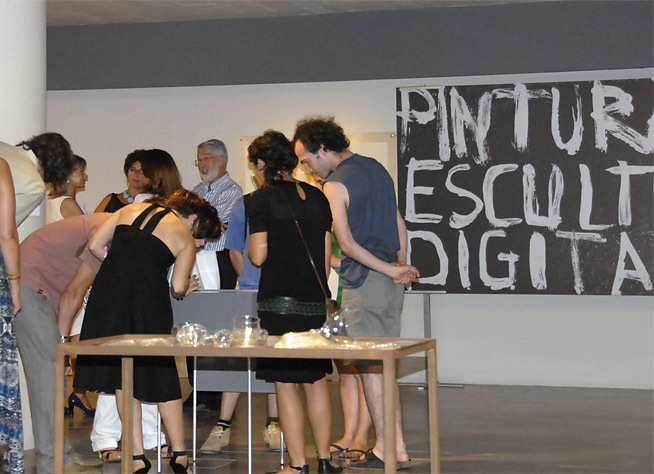 VALENCIA.- Bancaja is presenting the 35th Bancaja Prizes for Painting, Sculpture and Digital Art exhibition at the Valencian Institute of Modern Art (IVAM), where it will remain until 7th September. The show includes the winners in all three categories of this edition, as well as another 35 pieces chosen by the contest's jury as the best submissions. First prize in painting went to the work "Basura al mar" by Volkan; first prize in sculpture went to Aljoscha, for "Object 26: p-stations". Lastly, first prize in the digital art award was given to the work “The silent enigma 02”, by the artist Francisco Reina. In this year's edition, the juries awarded a second prize in all three categories, which went to the following works: "Paisajes desheredados" by Abigail Aguirre (painting), "Aquella noche hacía mucho calor" by Ana Oliva Higueras and Tiziana Chiara, Tiz-y-Ana, (sculpture), and "Chemin de Fer", by Pau García (digital art). Given the quality of the work presented, the jury also agreed to grant four honourable mentions. Two were awarded in the painting category, to Renato Costa for his work "Armonía en rosa y azul" and to Jesús Ángel Bordetas for "-Cromos- d"; another went to Patricia Gómez Villaescusa and Mª Jesús González Fernández for "Fachada Plegada" in the sculpture category; and the fourth went to Isabel Tallos for her work "Reverberación" in the digital art category. Following the exhibition at the Valencian Institute of Modern Art (IVAM), which will remain open until 7th September, the show will travel to different cities in Spain. 35th Bancaja Prizes for Painting, Sculpture and Digital Art. 506 artists from all over Spain and abroad participated in this year's edition. The region with the highest participation was the Community of Valencia with 294 entries, followed by Catalonia with 48, the Community of Madrid with 47 and Andalusia with 27. 62.25% of the participants were men and 37.75% women. Special attention should be called to the participation of foreign artists, which serves to underscore the fact that, in the 35 years since they were first launched, the Bancaja Prizes for Painting, Sculpture and Digital Art have truly become an international event. A total of 15 works were received from countries such as Germany, Colombia and Italy. The majority of submissions were made in the painting category, which registered a total of 292 entries. 139 works were submitted in the sculpture category and 75 were received in the digital art category. 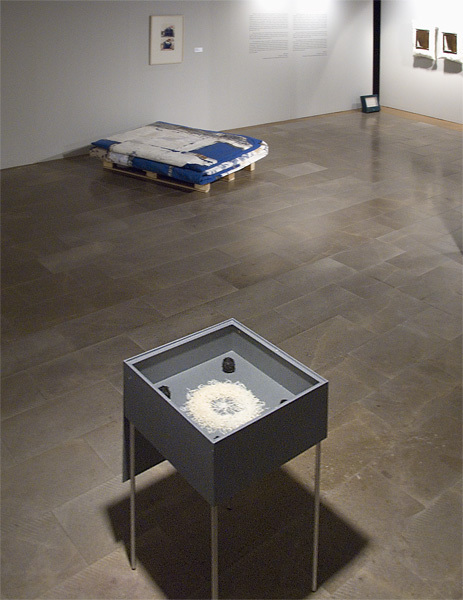 In addition to the prize purse, the contest is considered quite prestigious, as the winning works are shown at the IVAM and, subsequently, at different art centres throughout Spain. Moreover, a catalogue of the selected works is published with a view to disseminating the work of the young artists who participate in Bancaja's contest. Contemporary art, in a constant state of flux. Barbara Steffen, Chief Curator of Contemporary Art at the Albertina (Vienna), believes that the pieces chosen for this year's exhibition bear witness to the diversity of a contemporary art in a constant state of flux. It is an art that ranges from hyperrealism and collage to surfaces filled with minimalist geometric drawings or digitally altered photographs. According to Ms Steffen, just ten years ago the limits of new art were dictated by a handful of "trends". In Europe, in particular, contemporary art toiled under the yoke of the prevailing artistic wisdom, which was handed down by renowned art theorists in different specialised journals: minimalist art, conceptual art, expressive painting and video art, to name just a few, were developed in the United States and soon after displayed in Europe. Unlike in the United States, however, where multiple trends co-existed and continue to co-exist today, Europe, through its art schools and instructors, was dominated by single art movements, and alternative options were rarely accepted. According to Ms Steffen, today this rigidity appears to have ended. Art no longer comes exclusively from Western countries like those of Europe or the United States, but rather comes also from India, Russia or China. For the Chief Curator of Contemporary Art at the Albertina, the chances for an artist to produce art and have it shown internationally have changed. All the traditional art categories have been broken down, and today an artist can do as he or she pleases under the motto "everything goes". "Basura al mar (Agua del futuro)", Volkan. 1st Prize in Painting. For the author, this is not a protest piece; rather, it is one of the "infinite dreams in my head. It is like submerging your head in the sea in 100 years." Volkan considers the existence of contests such as the Bancaja Prizes for Painting, Sculpture and Digital Art to be a positive thing, as they offer considerable help, above all, to the winners. “Object 26: p-stations”, Aljoscha. 1st Prize in Sculpture. Aljoscha draws the inspiration for his works from bioism or biofuturism, which he uses to depict the creation of new life forms and a new organic life aesthetic for the future. "For me, bioism is a way to develop an art style based on vitality and complexity. When creating a piece, I try to imbue it with as much movement, breath and multiplicity as possible," he says. “The silent enigma 02”, Francisco Reina. 1st Prize in Digital Art. This work allows us to explore a situation in which several concepts, such as accessibility, privacy, silence, peacefulness and the unknown, have served as the basis for the creation of images. Drawing on these concepts, a scene was created that exudes a tangible sense of calm. Everything is enveloped by silence, which makes the peacefulness merely apparent. Whilst at first glance, nothing is happening, there is a suspended building within which something may (or may not) occur. Attention is focused on the inside of this structure, rather than the outside. The stairs beckon to us to enter and discover the enigma. To learn, even, why it the building seems to float. However, even as they encourage us to climb, they make it hard for us to do so, for they have lost all contact with the worldly. This work is a reflection on the possibilities we encounter in our daily lives and the obstacles we face when trying to achieve certain objectives. "Paisajes desheredados", Abigail Aguirre. 2nd Prize in Painting. "Paisajes desheredados" is an example of Abigail Aguirre's more colourful work. According to the artist, this piece bears witness to her research into concepts such as the primacy of the line, equilibrium between lines and spots of colour and the feeling of harmony that the co-existence of both stirs in the viewer. "I am interested in mixing materials, graphite and oil, in respecting the canvas as simply another element, in allowing what lurks beneath to show through," she explains. The uneasy sensation of incompletion contrasts with the peace that radiates from the brightness of the white and the work's horizontality, two features that often mark her work. There is a desire to reduce the composition to its minimum expression, to avoid all unnecessary elements. In this piece, it is represented by a lightweight structure in the foreground, built on fields of light, defending the beauty of silence, of the dispossessed. "Aquella noche hacía mucho calor", Ana Oliva Higueras and Tiziana Chiara, Tiz-y-Ana. 2nd Prize in Sculpture. In this piece by the artists Ana Oliva Higeras and Tiziana Chiara, eyeglasses and scarves visually meld together, arranged on a glass table with a surrealist touch. A pair of tap shoes, astride a white pedestal, rattles away with rhythmic movements at the simple press of a button. This sculpture evokes the action of a romantic dinner for two, in which the chemistry between the participants has literally melted all the objects that lie between them. To reproduce this idea, the authors chose to work with glass, since, in their own words, it is one of the materials that they have best mastered. "Chemin de fer", Pau García. 2nd Prize in Digital Art. This piece sprung from the artist's interest in all facets of graphic art and is part of a series that explores the decontextualisation of found objects with a view to imbuing them with artistic meaning. "It is an attempt to construct and deconstruct objects in order to assess their compositional possibilities," explains Mr García. "Armonía en rosa y azul", Renato Costa. Honourable Mention in the Painting Category. In real life, the little girl shown in the work is named Lucía, but here she is Mey-Ling. The piece is the artist's homage to the many girl children who are abandoned in China as a result of a government policy that favours males. The work seeks to show what her life will be like: the girl's past, present and future are the temporal planes depicted on the canvas. The girl is dreaming a peaceful dream, marked by shadows from the past, but also by a ray of hope, symbolised by a doll with Western features, an expression of her adoptive culture. Renato Costa intends to continue his explorations in different media and with different materials, prioritising the image and the composition, irrespective of the tools he uses to achieve it. “-Cromos- d”, Jesús Ángel Bordetas. Honourable Mention in the Painting Category. This piece belongs to an extensive series begun by the artist two and a half years ago, which aims to express ideas through a meta-pictorial language that can be developed in multiple forms and combined with facets of other media, such as photography or infographics. According to the artist, the choice of the figure of the horse was made on purely aesthetic grounds, as it enables a variety of combinations. “Fachada plegada”, Patricia Gómez Villaescusa and Mª Jesús González Fernández. Honourable Mention in the Sculpture Category. This work is part of the project "A la memoria del lugar", which was carried out over 2007 by the artists in the historical district of El Cabanyal in Valencia, where they made prints of buildings tagged for demolition. The project aimed to rescue the local landmarks and conserve them for posterity through the artists' interventions on certain houses prior to their demolition. The idea was to create a large archive of visual samples of their interiors and exteriors. Based on the artists' actions inside the buildings and vacant homes, prints were made on large canvases, allowing them to obtain a material record of the state of the structures and to create a physical and documentary archive to preserve the memory and history of places that no longer exist. “Reverberación”, Isabel Tallos. Honourable Mention in the Prize for Digital Art. In "Reverberación", Isabel Tallos depicts a photograph of a woman in a robe seated on the edge of a toilet in the bathroom at an anonymous hotel. Her reflection can be seen in the mirror on the wall, on the exact opposite side of the mirror. The woman seems lost in thought, isolated, a fugitive from her true reflection. In this sense, the author underscores the truthful nature of photographs. "Even granting what we know about digital manipulation, we can be certain that, at some point, some small part of that image really did exist." This fact helps makes photography the best technique for creating disturbing and confusing images. Support for entrepreneurs and a commitment to innovation are two of the guiding principles governing Bancaja's activities. The programmes carried out by its Philanthropic Work Division aim to improve citizens' living conditions through a three-fold action plan based on support for young people in the spheres of training, employment, housing, sport and social action; social development for senior citizens and immigrants; and support for cultural and artistic activities. Bancaja works hard to benefit society through its operations in different economic sectors and with the support it provides through the actions of its Philanthropic Work Division.The Bancaja Prizes for Painting, Sculpture and Digital Art form a part of its commitment to innovation, fostering creativity in young people and promoting artists who seek to enter the world of fine arts. The Bancaja Prizes for Painting and Sculpture are one of the most prestigious contests of their kind in Spain and have been held annually since 1974. The prizes were created to fill the void left when the city of Valencia's "Salón de Marzo" (March Exhibition) closed its doors for good. The thirty-fifth edition of the Bancaja Prizes for Painting, Sculpture and Digital Art bears witness to the innovative art forms that have both forged a path for myriad expressions of modernity and served to promote new generations of artists. The list of painters and sculptors from Spain and abroad who have passed down this path is long. The quality of the jury assembled by Bancaja to award its prizes has contributed greatly to the contest's prestige. The juries gathered over the years have always been comprised of prominent professionals from the most renowned European museums. - Ms Barbara Steffen, Chief Curator of Contemporary Art at the Albertina Museum, Vienna. - Mr. Michel Buhrs, Director of the Villa Stuck Museum, Munich. - Mr. Vicente Martínez, Sculptor, Valencia. - Mr. Javier Panera, Director of the DA2 in Salamanca. - Mr. Vicente Montesinos Vernetta, Vice President of the Bancaja Foundation. - Mr. Rafael Ferrando Giner, Vice Secretary of the Bancaja Foundation. - Ms Sally Radic, Advisor to the Bancaja Prizes.